Seeking to accommodate an increasing number of bicycle riders in Pittsburgh, the city will expand its network of shared and dedicated bike lanes in Oakland this summer. Kristin Saunders, the city’s bicycle-pedestrian coordinator, presented the final plans to an audience of nearly 100 at the Oakland Career Center on Semple Street on Thursday night. The 4- to 6-feet wide bike lanes will narrow vehicle travel lanes and eliminate some on-street parking that was lightly used, Ms. Saunders said. The bike lanes will be on both sides, and will be painted on the street with no delineator posts to separate them from vehicle lanes, she said. Several intersections will have a feature that is new to Pittsburgh but widely used elsewhere -- left-turn boxes that allow cyclists to move in front of stopped cars at a red signal to give them a head start. A bike lane also will be added in the block between where Bigelow makes a left turn at O’Hara Street and drops to Fifth Avenue. Assistant public works director Pat Hassett said the installation is planned for mid- to late August. The city also plans to extend the Schenley Drive bike lanes one block to where the street merges with Roberto Clemente Drive and add bike lanes from there out to Forbes Avenue. Several smaller stretches of side streets will get sharrows. Ms. Saunders began her presentation with survey data showing that 66 percent of people want more options besides automobile travel; 73 percent believe they must use a car to get around; but 57 percent would like to spend less time in their cars. In Pittsburgh, while just 2.2 percent of residents were reported by the U.S. Census as bicycle commuters, that was a 400 percent increase over previous counts, she said. 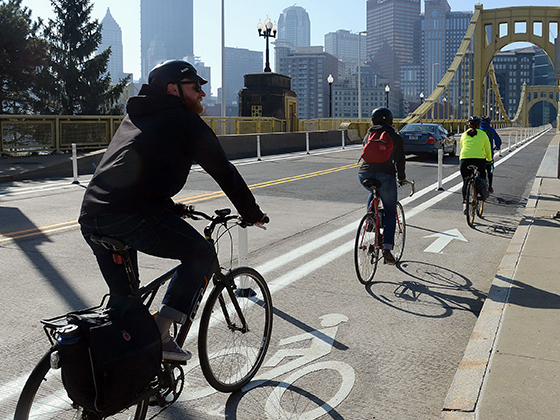 Mayor Bill Peduto signed an executive order this year calling for creation of a Complete Streets policy, which would require that projects be designed to accommodate all of a street’s users -- drivers, bicyclists, pedestrians and disabled people. To read more about the planned bike lane additions, see this presentation.